Pierre Hébert et Andrea Martignoni à Area Sismica, Medola. Pierre Hébert, John Hollenbeck, Erik Hove, Simon Millerd et Terri Hron, live animation performance (digital) at the Ministère in Montreal, during Off Jazz Festival, October 5 2018. Graphic score film in collaboration with signer/composer Viviane Houle, for the piece First Words premiered in Vancouver by the NOW Society Orchestra, on March 24 2018, as part of the Reflect the Times concert. Pierre Hébert, Guillaume Vallée, Alexandre St-Onge and Hazy Montagne Mystique, at Eastern Block in Montreal, 8 December 2017. See the VIDEO. Pierre Hébert, Mazen Kerbaj and Sharif Senhaoui , Masnaa Festival, Casablanca, Moroco, at Alliance Française, 12 May 2017. Voir the VIDEO. Pierre Hébert, Lori Freedman. 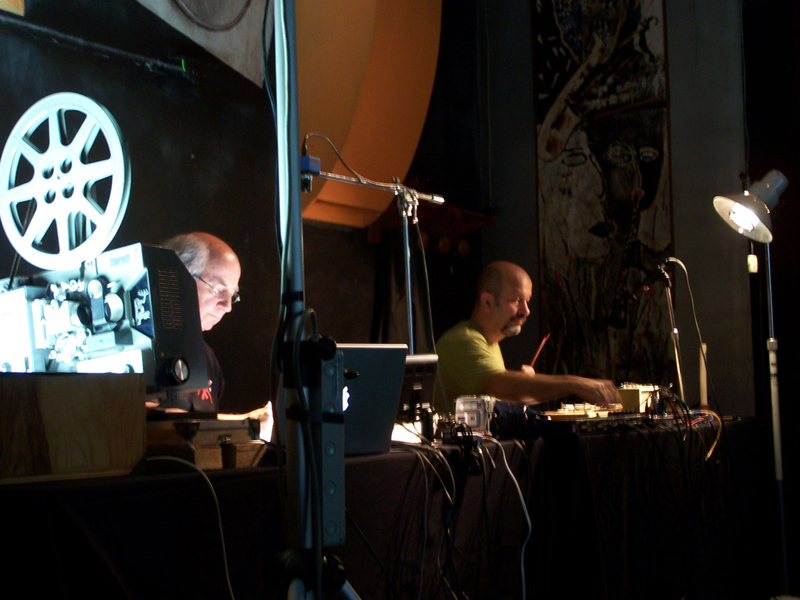 Olivier and Pierre-Alexandre Maranda, evening of improvisation at the Casa Obscura, December 10 2014, Montreal. Pierre Hébert Lori Freedman, Sam Chalabi and John Heward, an evening of improvisation at the Casa Obscura, Montreal, November 21 2012. See two extracts : no1, no2. Pierre Hébert and Andrea Martignoni Performance «Digital Scratch» performance «live scratching directly on film/live animation and live digital processing», Animator, International Animated Film Festival, Poznan, Poland. See the VIDEO..
Pierre Hébert with Étienne Noreau-Hébert Performance «Silence – homage to John Cage» , July 8 2012, at the Kunstlerhaus Bethamien, Berlin. See the VIDEO. Pierre Hébert, Mazen Kerbaj, Andrea Martignoni, Eduardo Raon Four hands performance with Mazen Kerbaj, music Andrea Martignoni and Eduardo Raon. July 1 2012, Beatbit Festival, Guimaraes, Portugal. Pierre Hébert, Jean Detheux Jean Derome, Pierre Tanguay and Jean-Philippe Collard-Neven images duet with Jean Detheux, music, Jean Derome, Pierre Tanguay and Jean-Philippe Collard-Neven. October 22 2011 Quebec Jazz Festival, Le Périscope, Quebec City. Pierre Hébert et Jean Detheux, Jean Derome, Pierre Tanguay and Jean-Philippe Collard-Neven images duet with Jean Detheux, music, Jean Derome, Pierre Tanguay and Jean-Philippe Collard-Neven. October 11 2011, Off du Festival de jazz, Chapelle historique du Bon Pasteur, Montreal. Pierre Hébert and Eduardo Raon, improvisation presented at the Slovenska Kinoteka, in Ljubljana, on May 24 2011. 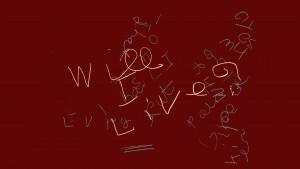 See the VIDEO It was presented with version of «49 Flies» in duet with harp player Eduardo Raon. 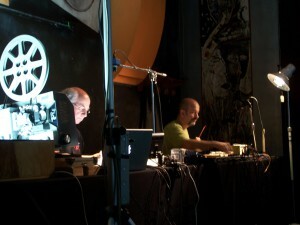 Pierre Hébert and Massimo Ceccarelli, improvisation presented at La Riunione di Condominio, in Rome on May 21 2011. See the VIDEO. It was presented with version of «49 Flies» in duet with double bass player Massimo Ceccarelli. Pierre Hébert & Fraction (Eric Reynaud), improvisation, “Tendances” Festival, Maison de la Culture de Amiens, January 20 2011. Nitshisseniten e tshissenitamin (I know that you know) Show of signer Chloé Sainte-Marie, totally sung in the Innu language (music and lyrics by Philippe McKenzie), premiered on Feb. 12, at Theater Gesu in Montreal. Video design by Pierre Hébert; direction by Brigitte Haentjens; set design by Simon Guilbault. Animation Exercise The Winnipeg Film Group Cinematheque, October 30 2009, Winnipeg (recorded music by Bob Ostertag); Loop Studio, Artscape Wychwood Barns, Toronto, copresented by New Adventure in Sound Art and The Pleasure Dome, Octobre 2009 23-24 (live music by Stefan Smulovitz and live scratched animation); Area Sismica, Meldola (Forli), Octobre 3 2009 (live music by Andrea Martignoni and live scratched animation), watch the VIDEO; INIT Club, presented by Compu Events, Rome, Sept. 29 2009, (recorded music by Bob Ostertag), watch the VIDEO; Théâtre de la Vieille Grille, Paris, Sept. 8 2009 (recorded music by Bob Ostertag). Improvisation sur Felix the Cat avec Karl Lemieux, Alexandre St-Onge et Roger Tellier-Craig, 4 décembre 2009, dans le cadre des Sommets du cinéma d’animation, à la Cinémathèque québécoise. Performance de projection 16 mm à trois projecteurs par Karl Lemieux accompagné d’une performance d’animation en direct de Pierre Hébert, avec utilisation simultanée d’un dispositif numérique et de gravure sur pellicule . Robert’s Creek with Stefan Smulovitz, Gumboot Cafe, Roberts Creek, B.C., Oct. 19 2010; Loop Studio, Artscape Wychwood Barns, Toronto, October 23-24 2009; with Stefan smulovitz, Vivianne Houle and Lori Freedman, Casa Obscura, Montreal, May 27 2009. Watch the VIDEO. Glaces (Floating ice) Solo performance with recorded music by Pierre Duchesne, at the auditorium of the fine arts faculty of the University of Lisbon, February 6 2009, Lisbon. Collective improvisation of live animation between Jean Detheux, Pierre Hébert et the Basmati collective (Saul Saguatti from Bologna and Audrey Coïaniz from Marseille) with music by Jean Derome and his friends, at the Casa Obscura, Montreal, September 17 2008. See the VIDEO. Filature by Joane Hétu, live video mixing , Guelph Jazz Festival, Guelph, Canada, September 5 2008. Glaces (Ghiaccie) solo performance with music by Pierre Duchesne, IO PROJECT (Investigation about Ontology), Macchiagodena, Italy, May 17, 2008. Fantômes – Le Métro reloaded with Robert Marcel Lepage and René Lussier, special event of Festival du nouveau cinéma, for the launching of the DVD set Pierre Hébert -The Sience of Animated Images, Octobre 17 2007, at Société des arts technologiques, Montreal. Filature by Joane Hétu, live video mixing, Festival International de Musique Actuelle de Victoriaville , May 21, 2007, Laurier Theater, Victoriaville, Canada. Opening of Champ Libre, performance with Diane Labrosse, September18, 2006, Grande bibliothèque auditorium, Montreal, Canada. Evening of collective improvisation, May 20, 2006, Computational Poetics Gathering, Simon Frazer University, Vancouver, Canada. Filature, live video mixing for a musical theater piece by Joane Hétu, February 16 to 18, 2006, Usine C, Montreal, Canada. Improvisation, with Fred Frith, Intersection for the Arts, September 23, 2004, San Francisco,U.S.A. Improvisation, with Theo Bleckman, Barre Philips et….., Guelph Jazz Festival, September 2004, Guelph, Canada. Homage to Francis Bacon with Bob Ostertag and Theo Bleckmann, Fundacao Serralves, March 2003, Porto, Portugal. Improvisation, (live scratched animation) with Carlos Bica, Symposium on Animation and Other Arts, organized by Casa da animacao, November 22. 2001, Rivoli Theater, Porto, Portugal. Fleuve (ScratchVidéo/scratching on film) with Éric Gagnon et Frédéric Lebrasseur, February 9-10, 2001, Mois multi, Méduse, Quebec ; February 15-16, Vasistas, 2001, Théâtre de la Chapelle, Montreal; August 19. 2001, Théâtre de la Verdure, Montreal. Four hands Piano, (live scratched animation), improvisation with Guillaume Dostaler, September 9, 2000 Quickdraw Animation Society Calgary; September 20, 2000,. Ottawa International Animation Festival; September 28 and 30, Cinémathèque Québécoise, Montreal. Test (ScratchVidéo/scratching on film) with Éric Gagnon, Rendez vous du cinéma québecois,, February 25, 2000, Cinémathèque québécoise, Montréal ; July 13, Galerie Axe Néo 7, Hull ; soirée PRIM/Vidéographe (with Fred Lebrasseur), 15 September 15, Cabaret Le Lion d’Or, Montreal; October 6, Musée de la Civilisation (avec Jocelyn Robert et Pascale Landry), Québec. Improvisation, (live scratched animation) with Andrea Martignoni, April 6, 2000, Kind of Blues Festival, Milano, Italy. Entre Basura y Ciencia, (live scratched animation), with Bob Ostertag et Baltasar Lopez, February 11-13 2000, Yerba Buena Center for the Arts, San Francisco, U.S.A.
Conference/Performance (solo performance of live scratched animation with recorded music by Bob Ostertag, sometimes under the title Breathless Machines), November 27, 1999 Festival Fantoche, Baden, Switzerland; October,1999, Student Animation Festival, Ottawa; September 27, 2000, Cinémathèque québécoise, Montreal ; November 19, 2000, Holland Animation Festival, Utrecht, Nederlands ; November 21, 2000, Tele Ciencia Festival, Universitade de Tras-os-montes e alto douro, Villa Real, Portugal; November 23, 2000, Universitade de Aveiro, Aveiro, Portugal; November 2000, Café-théâtre La Vieille Grille, Paris; January 23, 2001, Sonora University, Hermosillo, Mexico, October 31 2001, CEGEP de Saint-Laurent, Montreal, Décember 1, 2001, Maison du livre de l’image et du son, Villeurbane (Lyon), France; Décember 15, 2001, Hallwalls artist center, Buffalo, USA ; October 1-2, 2002, FilmStudio, Rome, Italy (this was my last live scratched animation until October 2009 in Meldola, Italy). Nous perçons les oreilles, (live scratched animation), cinema/music/writing impro with Jean Derome, Johanne Hétu and Sylvie Massicotte, March 17 1998, Maison de la culture Mt-Royal, Montreal. Improvisation, (live scratched animation) with Bob Ostertag, Sonic Acts Festival., August 28, 1997, Paradiso, Amsterdam, Nederlands..
Spiral, films for a multidisciplinary piece by Bob Ostertag on a text by David Wojnarowicz, . (production The Exploratorium), April 26-27, 1996, Cowell Theater, San Francisco, USA. Le combat avec l’ange, (live scratched animation) with Robert M. Lepage, Festival de film de Belfort / Entre-vues, November1995, Belfort, France. Improvisation (live scratched animation), with David Borden, July 22, 1993, Cornell Cinema, Cornell University, Ithaca, USA. I think we should (burn the damned thing down), (live scratched animation), with Bob Ostertag, November 6 to 14 1992, Vienna, Innsbruck, Wels, Salzburg, Nurnberg et Ulm, Austria/Germany. Sooner or later, (live scratched animation), with Bob Ostertag, March 21 to 24, 1991, Taktlos festival, Bern, Zurich and Bazel, Suitzerland ; also under the title Starting from scratch, February 21, 1991, Pacific Film Archive, Berkeley, and February 24, San Francisco Cinematheque, The Eye Galery, San Francisco, USA. La plante humaine, (live scratched animation), with Robert M. Lepage, October 17 to 28, 1990, Festival du Nouveau Cinéma, Théatre La Chapelle, Montreal ; also April 5, 1990, CEGEP de Matane, April 13, 1990, OPTICA Galery, Montreal, and from July 26 to August 1 1991, tour of Brittany, France. In Memory, film and live scratched animation on music by Fred Frith, Next Wave/New Music America festival 89, November 14, 1989, Brooklyn Academy of Music Playhouse, , New York, USA. Fred Frith connection projekte, (live scratched animation). with 15 musicians and one dancer, May 13 to 15 1989, New Jazz Festival, Moers, Germany. Solo performances of live scratch animation, March 20 to 22 1989, Centre de formation technique Les Gobelins, Paris, France; March 29, 1989, School of visual arts, Ottawa University. Frith/Hébert Duet (live scratched animation), with Fred Frith, January 6 to 8, 1989, Contemporary Art Museum, Montreal ; also July 1, 1989, Glasgow International Jazz Festival, United Kingdom. Mutations, films, transparencies and drawings for a multi-média show by Michel Lemieux, Calgary Winter Olympic Games, also in Montreal, Métropolis, three weeks in March. Adieu Leonardo (live scratched animation) with Jean Derome, Robert M. Lepage et René Lussier, du 9 au 17 October 9 to 17, 1987, at the Montreal Museum of Fine Arts; also April 4, 1988, Du Maurier Theatre, Harbour Front, Toronto ; then with Robert M. Lepage, 5ième Festival international de la bande dessinée, April 6-7 1989, Centre d’essai de l’Université de Montréal, August 2 to September 7, tour in the Nederlands (Holland Animation Festival, t’Hoogt, Utrecht; Frascati Theater, Amsterdam; Middleburgh Film Theater; Oude Theater, Oss). Adieu bipède (live scratched animation) with Jean Derome, Robert M. Lepage and René Lussier, February 10 1987, Rendez-vous du cinéma québécois ; April 1-3 1987, Chicoutimi, Jonquière and Alma. Confitures de Gagaku, (live scratched animation) multidisciplinary show by Jean Derome, September18 to 28 1986, Centre culturel Calixa-Lavallée, Montreal ; opening of the Festival international de musique actuelle de Victoriaville-1987, and March 19, 1988, Spectrum, Montreal. This was my first project with live scratched animation. La symphonie interminable with Jean Derome, Robert M. Lepage and René Lussier, European Tour (LaRochelle, Paris, Bruxelles and Amsterdam) December 1985; 14 presentations, February and April 1986, Cinéma ONF du Complexe Guy Favreau, Montreal. Chants et danses du monde inanimé with Robert M. Lepage and René Lussier, in 1984, Rouyn-Noranda, Montreal et Quebec City, and in 1985, Sherbrooke, Victoriaville, and Montreal International Jazz Festival.